As I mentioned in my post on June 18, my husband retired last May after many years as a professor of Biology. While his retirement has been busy as ever, he seems to be enjoying it—and that’s the point, right? One of the things he agreed to do for our university was to teach a course in Paraguay as part of our “Partners in Paraguay” program. While I’ve known for several months that he would be taking this on, I have not been happy about the idea of being separated for an entire month. We’ve both been there twice to teach in the last several years, and it was a great experience. But we went there together. The idea of him going without me challenged my normally cheerful nature. So I brooded, complained, and pouted for weeks leading up to the day he left. As he walked to his boarding gate on September 26, we promised that we would take advantage of Skype technology and talk—face to face—every day. And we have. As I walked out of the airport, I was reminded of a book I read several years ago about Abigail and John Adams. 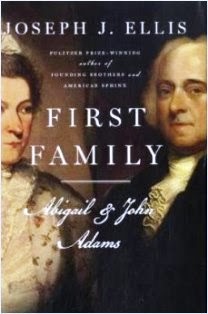 The book, FIRST FAMILY: ABIGAIL & JOHN ADAMS, by Joseph Ellis, was a fascinating read in part because it was primarily a compilation of the letters between the Adamses during the lengthy separations they endured in their marriage. In her letters, Abigail frequently addressed her husband as “My Dearest Friend.” They were both prolific letter writers, though sometimes they had to wait weeks or even months to receive a reply to their correspondences. The letters demonstrate that while they were frustrated with long separations, their relationship was both strong and passionate. The letters also addressed the issues of the day—the war and the independence of this nation. No small concerns. And writing to one another was their only connection. There was no email, no Skype. Perhaps what impressed me most was how beautifully written their letters were, with expressions of deep loneliness as well as affection. Since then, of course, letter writing has become a lost art. As I thought about what they both endured during these separations—particularly Abigail, I began to feel a little childish about my pouting and complaining. Certainly, if she could tolerate, unhappy as she may have been about it, literally years of separations, with only letters to connect her to John, then I could survive for four weeks with email and Skype as my only connections to my husband Jim. Right? And, while I'm at it, maybe I should just write a nice long letter. How long has it been since you’ve written an actual letter? I still write the occasional letter - one recently to a high school friend who said, "I can't remember the last time I got an actual letter!" I'm a writer. I communicate better in writing than verbally, so maybe it's no surprise that I like to write letters! I haven't been separated from my husband for more than a couple of days since we met almost 20 years ago. Next spring I'll be gone for a two week period, and the thought of it kind of made me queasy. You've given me an idea - Skype! Perfect! Thanks. Believe it or not, in this day and age, I still correspond with a couple of friends by snail mail. I think it has been about a week since my last letter. A few years ago, Kerrie hosted a letter-writing event. I wrote one to my sister, and I'm pleased to report that we are still corresponding by mail. As a matter of fact, my letter-in-progress to her is on my desk right now. Fantastic post! I used to write my grandmother and grandfather as often as I could. They both passed away last year and I miss both getting their correspondence as well as sending them a page or two of my own. Its something that we should all try to preserve. Not much can beat getting a letter in the mail from someone you love. Love all your comments! You've inspired me to write some letters--really!! Thanks! I think it's wonderful that you so cherish your time with your husband! My husband read the John Adams biography and we had the same discussion. It's amazing how different life and relationships were at that time. I'm glad to hear from the comments that letter writing isn't a completely lost art.